commence their professional life as a teacher. Each year UC seeks around 1100 places in schools for our Primary and Secondary students from 1st to 4th year. Undergraduate students are required to complete 80 or 85 days and graduate entry students complete 60. This undertaking is dependent on the support of schools in the ACT and surrounding areas in providing quality professional experience. Around 120 schools provide places for UC students. After reviewing our communication with schools, placement documentation is now available on this site, as well as in hardcopy. The Faculty of Education aims to work closely with School Professional Experience Coordinators (SPECs) and mentors to support them in their important role. More details for SPECs and mentors are available on the page - For schools - Information and forms. 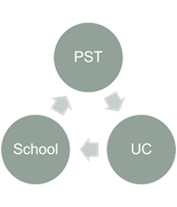 Information for PSTs is available on the page - For preservice teachers - Overview and links.